Hebrew poet; relative of Moses Naḥmanides; lived at Gerona, Catalonia, in the second half of the thirteenth century. In the letter Naḥmanides wrote to his son from Jerusalem he sends his greetings to Gerondi, whom he calls "beni wetalmidi," and asks his son to tell the poet that he has read his (Gerondi's) verses with bitter tears on the Mount of Olives, opposite the Temple. This refers probably to a dirge on the destruction of Jerusalem which Landshuth takes to be identical with the elegy included in Naḥmanides' commentary to the Pentateuch (toward the end). Of Gerondi's religious poems only a Ḳaddish for Sabbath Zakor, , and a pizmon for Purim, , are known; perhaps he also wrote the piyyuṭ . 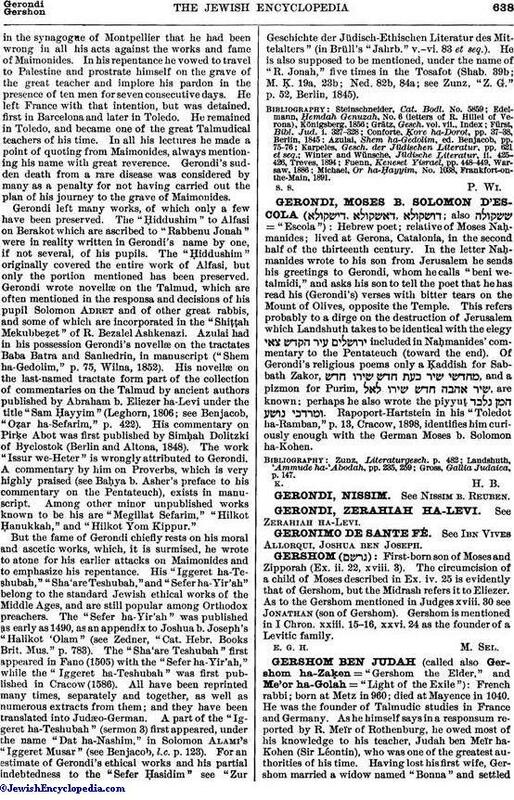 Rapoport-Hartstein in his "Toledot ha-Ramban," p. 13, Cracow, 1898, identifies him curiously enough with the German Moses b. Solomon ha-Kohen. Gross, Gallia Judaica, p. 147.